There are 3 levels of detail for Pricing and Costing within ElectroPlan to suit the way you want to operate. Check the explanations below for more details. You can use these in combination with each other and change the mode of operation at any time. The processing of prices through the system is done step by step so that you can control the process and over-ride the process at any time to suit the way you want the system operate. This is the simplest mode of pricing and works by just entering a price (excl GST) into the ‘Standard Price’ field for a Component.  This value can be anything from a educated guess to a value calculated outside of ElectroPlan based on the time and materials involved. Once defined in the system Cost Items can be used in the “Component Calculator” for any number of Components. Each Cost Item has a Code, Description, Product Range, Category, Cost, Margin % and Total Cost including Margin. Description – A brief description of the item. Product Range – A designation of quality / design / model / manufacturer (etc) options for the composition of the Component. Margin % – The percentage you add on to your buy price from your supplier to create a price for the item to your customer. 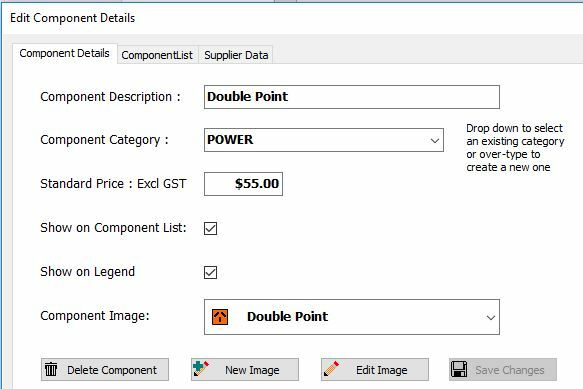 Total Including Margin – the value of the Cost Item which will be added to all the other Cost Items in a Component’s Cost Calculation to arrive at a total price for the Component excluding GST. If the list of Cost Items is set to a single Category (See ‘Select Category’ below) the margin of the selected Cost Item can be replicated to all the other items in the same Category by clicking the “Copy Margin to Selected Category” button. The top panel shows the selected Cost Items to define the items used for a Double Point which is used an an example in the ElectroPlan Free Trial version. The lower panel has the list of all defined Cost Items with pricing and margins. These are also supplied with the Free Trial of ElectroPlan and can be deleted and changed if you want to set up your own system of Cost Items. The ‘Search’ and ‘Select Category’ controls are used to confine the list of Cost Items to quickly locate any Cost Item in the list. The green Quantity column can be edited to contain the quantities of the various items required. When first added to the calculation, items have their Quantity set to 1 by default. In the trial version of ElectroPlan these quantities cannot be edited. The sample set of Cost Items provided for demonstration purposes have prices set to $1 or $50 for tradesman hours. These can be edited as required in the registered version of ElectroPlan. Component Prices can be updated from the Cost Calculator one at a time using the “Copy Price to Component” button or for all Cost Items using the “Update Prices – All Components” button. 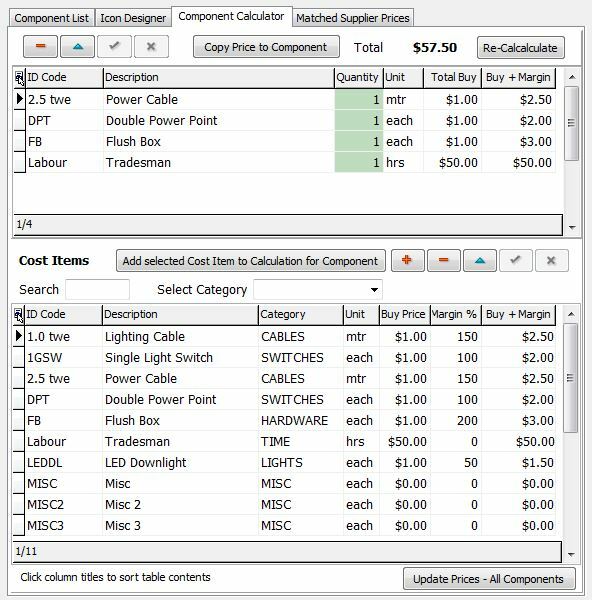 The “Component Calculator” allows ElectroPlan to break down the Components used in a project to compile a list of Cost Items required to complete the job. This is available for each plan within the project and also for the project as a whole. Of particular interest are the Cost Items for Time and Cabling as these will give you calculations for the time to complete the job and the total length of each cable type required. To see these calculations go to the Project Information Panel (the tab to the left of the project plans), then go to the “Price /Cost Info.” tab then to the “Cost Items” tab. The information shown is updated as changes are made to the project or to the components. Note : If any of the numeric fields of the Cost Items or Component Calculator are left blank or the contents gets deleted for any reason, then a default value of 0.00 is automatically inserted. The default value for the Qty field in the Component Calculator is 1. If the labour content of a project is tax exempt in your jurisdiction then you can use the TIME category total to separate this tax exempt amount from the project total for the calculation of the final project invoice value. *** If you need any assistance with setting up ElectroPlan for your tax jurisdiction, please contact us at ElectroPlan. Refer back to the image above … the Power Point has two options for the actual power outlet – a PDL product and a DELUX option with different prices. 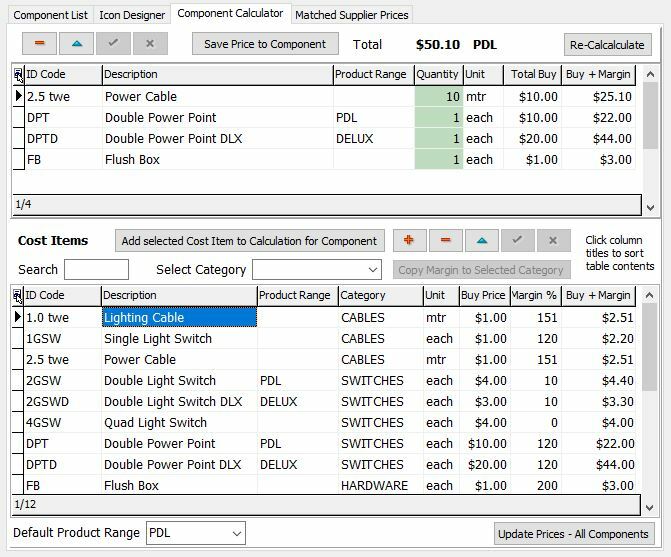 The System Setting for the Default Product Range is PDL meaning the basic price calculated by the Component Calculator will be done using the PDL option. The two Cost Items with the blank Product Range will always be included in the price calculation. To get the Component Calculation in the top panel to reflect changes to any Cost Item – click the Re-Calculate button. This view of the project in the Price/Cost Info tab of the Project Details tab shows the Components in the Project by Price. The Default Product Range is set to PDL, so the basic prices are from the PDL Cost Items in the Component Calculator. + DELUX shows the additional price premium per unit for the DELUX option over the PDL option. Tot. DELUX shows the total additional price for all the components used in the project. A negative value (shown in brackets) indicates the DELUX compared price is lower then the PDL option. The price comparison shows the DIFFERENCE between the two Product Ranges irrespective of whether the Component Price is the same as the Component Calculator’s price for the component. With the DELUX option selected all of the tabs showing Price and Cost Information for the project are updated with additional information … including the calculation of the quantities of Cost Items. Most Suppliers allow you to download a price catalogue from their website containing all their products, or catalogue of your purchases over the past 12 months including your Buy Price and the current Trade Price. Any comma separated value (CSV) file can be read by the system and the columns identified for future use. This includes product catalogues, invoices, orders etc. The columns actually used by the system are: Product Code, Description, Buy Price and Units. Supplier’s Product Codes are matched to your Cost Item Codes so that a margin can be applied and when a re-cost is required the latest price information is available in the system to update the Cost Items and then on up to the next level to re-calculate Component Standard Prices. The image below shows the list of Cost Items and, for the selected Cost Item (Flush Box) the Supplier’s Product Codes that have been matched with this Cost Item so that the system has a Buy Price to use. The data file shown in the left hand panel above is included in the Free Trial version of ElectroPlan and shows the catalogued view of a typical supplier data file. There are other products from the data file matched to other Cost Items as an example of how to use the system to utilize suppliers data to build costs and prices for the components placed on project plans. A Cost Item may have more then one matched Product Code, but only one of the matched Supplier’s Product Codes can be selected as the Buy Price to use for the Cost Item. The selected match is indicated by the “<” symbol in the right most column. To change the selected match – double click the one that is to be the new selected match. Having the ability to match a range of products from the same or several suppliers allows you to see at a glance the range of prices for products that are relevant to the Cost Item and to the Component(s) that exists on a plan. As prices change through successive downloads the system can report changes and allow you to have a representative price for the Cost Item and so an accurate price for the Components that the Cost Item is used in. The matched prices are copied to the matched Cost Items Buy Price by clicking the “Update Buy Price – All Cost Items” button. – Select any component from the Component Selector so that the “Comp. Calc.” Tool Button is enabled. – Click the “Comp. Calc.” button to open the Component Calculator for the selected component. – The lower panel on the right hand side of the “Edit Component Details” window has a list of the defined Cost Items. If no Cost Items have been created there is a button to click to load a sample set of Cost Codes. – To Add a Cost Item, click the red ‘+’ button in this lower panel – A new item will be added to the table. Fill in the fields following the notes below. To charge the contents of any entry of the table click the entry twice to highlight it all and a third time to get the typing cursor. Category – This is used to group like items eg SWITCHES, CABLE, HARDWARE etc. You can type a new Category into the column or click the editing space twice to open a pick-list of existing Categories. The Category ‘TIME’ has a special use to distinguish between purchased items and tradesman hours. This is important when the system is compiling purchase and staff time requirements. Unit – The unit of measure – Each, Meter, Hour etc. Cost – The cost of one unit of the item. This can be typed in as a representative value across all the Suppliers you purchase from or can be your actual buy price from a specific Supplier. Total Including Margin – the value of the Cost Item which will be added to all the other Cost Items in the Component’s Cost Calculation to arrive at a total price for the Component excluding GST. Locate a Cost Item that will be used for the Component. Click the “Add selected Cost Item to Calculation for Component” button to add the Cost Item to the Calculation for the Component. The Quantity will be set to 1 by default. Edit the Quantity required and Click the “Re-Calculate” button. Repeat for as many Cost Items as are required. To copy the resulting price to the Component – Click the “Copy Price to Component” button. You can also edit the Component Price field directly if you prefer. Click the “Update Prices – All Components” button under the list of Cost Items. This will update all Component Prices that have Cost Items entered into the Cost Calculator. 1 – Download the required file from the Supplier’s website – Save it to a specific location on your computer for the purpose so all similar downloads are together. You may have to change your browser options so that you get to choose the location that the file is saved to. The down;load files are CSV (Comma Separated Value) text files that can be viewed in any spreadsheet program. 2 – Click the “Supplier Data” button to open the “Edit Component Details” window. 3 – Click the “Open Data File” button and navigate to the location where the download file was saved to. Highlight the file and Click the “Open” button. The first 10 records of the file will be read and displayed. Click “Ok” on the information dialogue, which has a brief reminder of what to do next. 5 – Click the “Add to Catalogue” button to add the file to the catalogue. Some file have column headings in the first record. Check the “Use first row as column titles” box to have these automatically copied to the column headings. If there are no column headings or you want to change any of the headings – click the header of the column to change and then type the heading you want to use or choose from the drop down list. Not all columns in a download file are needed, these can be removed from view by first clicking on the column title area to enable the “Hide” button and then clicking the button. To restore all columns to being visible, click the “Un-Hide All Columns” button which will give all columns a minimal width and can be seen. 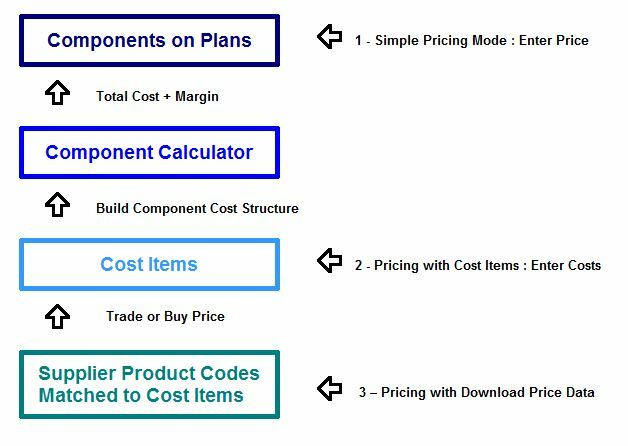 NOTE : In order for ElectroPlan to be able to extract product information from the file these 4 headings must be defined… Product Code, Description, Buy Price and Unit. These are the first 4 entries in the column heading drop-down box. NOTE : When you download and updated version of the same data file with new products and prices make sure it is saved in the same place with the same name (thus over-writing the previous file) in order to be accessed by the system using the established catalogue entry. Open the Supplier Data panel and select the downloaded data file from the Catalogue. This will read the file information from the Catalogue and the first 10 records. To read and be able to scroll and search through the whole file select “All Records” from the “Data View Mode” drop-down list. Between the square brackets type some text for the system to look for in the file in order to select entries you are interested in like a Manufacturer’s name or Code, or [Cable] to get all the cable products. You may have to familiarize yourself with the content of the file and the way the Supplier describes their range as which column information they provide. Once you have the file open and the product range in view you can scroll through the file and look for the entries you need. To assist there is a “Find” function which will look forwards or backwards in the file. Enter the test to find in the edit box, or drop down the list to re-find an entry. The search is not case sensitive so ‘out’ will match ‘Outlet’ or ‘OUTLET’. When you have located a product to match to an ElectroPlan Cost Item, click the “>> Supplier Data Panel Narrow <<” button if the “Matched Supplier Prices” tab is not visible on the right hand side of the window. To make a match – Select the Cost Item and the Supplier’s Product Code – the “Match …” button will show the Product Code and the Cost Item Code about to be matched – Click the button to make the match. This process links the product to the cost item so that subsequent price files downloads will update the Cost Item Buy Price and so provide a flow on into the Component Prices. You can match more than one Product Code with a Cost Item. However only one match will provide the system with an updated price for the Cost Item and in turn the price to add in to a Component including a margin %. The selected record is indicated by the “<” character in the right hand column. To change the match that determines the price – double click the required Product Code entry. Manual Product Match Entry … to bypass the need for a download file from a supplier there is a quick way to add supplier products to the system. Click the “Add Supplier Product Code to Price Records” button and fill in the fields for the new record. NOTE: The Supplier Code entry for the download file will be used to identify the Supplier in the matched product code entry. It is important to keep this Supplier Code consistent to enable the system to correctly match future price downloads . NOTE : The Supplier’s data file must be in the Supplier Data Catalogue and the Product Codes must be matched with ElectroPlan Cost Items in order to be updated in ElectroPlan. Click “Read Prices from File” – this process will scan the data file for Products that have been matched to ElectroPlan Cost Codes. When a match is found the Buy Price for the Product will be updated. See the section “Update all Cost Items with the latest Supplier Prices” (below) to further copy these prices to the Cost Codes themselves. The latest Product Prices are stored in the in the system in the Matched Supplier Prices listing above the Cost Items panel. Below this panel is the “Update Buy Price – All Cost Items” button. Click this button to transfer the latest Supplier Price to the Cost Items. These will be used in the Cost Calculator to enable Component Prices to be calculated. View / Edit / Export the Materials List for the Project. 1 – Go to the “Price/Cost Info.” tab then to the “Cost Items” tab. The information shown is updated as changes are made to the project or to the components. The information is based on the accumulated calculations for quantities based on the Component Calculator for each Component. Any Components added to the project that do not have a Component Calculator entry are added in the lower panel so you can see additional Components or where a Component Calculation is missing from your setup. All the Cost Items and Components with no Component Calculator are shown with the quantities calculated. Any Components with special prices are shown on a separate line according to the various prices entered. Enter any Order Comments required eg Wholesaler Product Codes, extra description, notes to the Sparky on the job etc. A complete listing is available (including the plans) using the usual Export PDF button or the Export PDF button above the listing. The ElectroPlan software system was created to provide a new electrical installation business with a rapid development environment for the creation, costing, and documentation of electrical plans. The owner of that business and a software developer worked together to develop the system from a user’s perspective so that the features included are relevant to the day to day requirement of the business. ElectroPlan Limited was formed to bring the benefits of the software to a wider audience. PRIVACY: Please be assured that the project information you enter into your ElectroPlan system is not, and cannot be accessed by us at ElectroPlan or any other Electrical Contractor or Electrical Wholesaler.